Last week I expounded on the theory that you should sell in May and go away. How did we do this week with that selling strategy? Not so good. The Dow was up 4.41%, and the S&P 500 was up 5.89%. At this rate the markets will be making new highs by the end of the summer. On March 9 the S&P was at 676; it closed Friday at 929, for an impressive 29% gain in two months. Sure sounds like a bull market, right? But let’s not forget that from November 20, 2008 to January 6, 2009 the S&P rose almost 16%, to 935, and everyone thought that was a new bull market, until all of those gains were erased, and a new low was made on March 9. That was a sucker’s rally. Unfortunately, Sucker’s Rallys are common in bear markets. 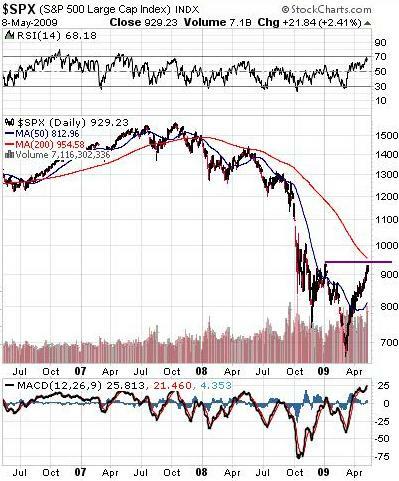 The 2000 to 2002 bear market had three sucker’s rallies, with average gains of 21 per cent in the Dow Jones Industrials over 45 days periods. During the Great Depression, the most severe bear market ever between 1929 and 1932, there were six sucker’s rallies, with an average gain of 47 per cent each. So, am I impressed by the fact that the S&P is up 29% in two months. No I am not. Technically, the RSI is now at the highest level it’s been since the start of the bear market; at these levels markets normally pull back. Also, the 200 day moving average is a significant resistance level, so a pull back as we approach 954 is to be expected. Finally, the top in January of 935 is also a resistance level, so with the S&P at 929 we could be close to a top. Fundamentally, there are lots of other problems. Unemployment is up. Government spending and deficits are at record highs. The auto industry is in shambles. Even Toyota is losing money. So why are the market’s rising? Because that’s what a bear market rally is. A bounce in a bear market. I am unconvinced, and I will remain so. I may leave lots of profit on the table if the rally continues, but if I remain largely in cash I won’t lose anything if this goes the other way. Sell in May and stay away. The weather is nice at this time of year. Sunday is Mother’s Day. Take a break from the markets. Spend time with your mother, or a mother close to you. Let the market’s do their thing, and start buying again when we get the next crash, which I assume will happen at some point before the end of the summer. And now, I will take my own advice and shut off the computer and go outside to work. I am putting down the hammer that is the time we spend analyzing charts and graphs. To borrow a thought from Steve Earle, put the hammer down, stop dragging the weight around, ignore the markets for the rest of the weekend, and let’s see what happens next week. Thanks for reading; see you next week.